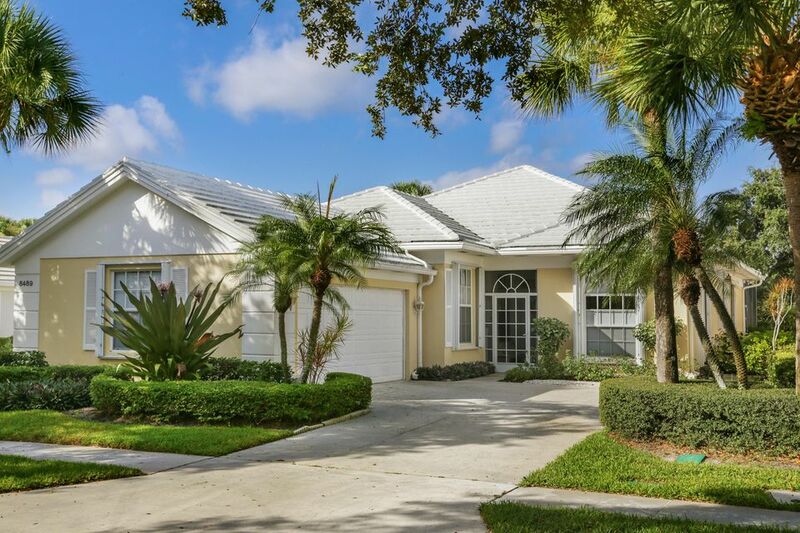 Stunning Sunset views from this waterfront pool home overlooking a majestic lake with fountain and various species of birds for Florida living at its finest! Currently only & largest &apos;Carmel Model&apos; available in Garden Oaks. Open & airy floor plan with 3 BR/2 Bath plus den, granite & tile countertops and backsplash in kitchen with a newer stove/oven & dishwasher. The bedrooms are designed with split living arrangements with the Master Bedroom opening onto the pool area and lake views! The Master bath suite features two separate sink areas plus private water closet and separate tub and shower areas. Accordion shutters,retractable awnings, Screened salt water pool w/new pump and filter, solar panel heated hot water heater and panels for pool! Clubhouse, pool, tennis & manned gate.